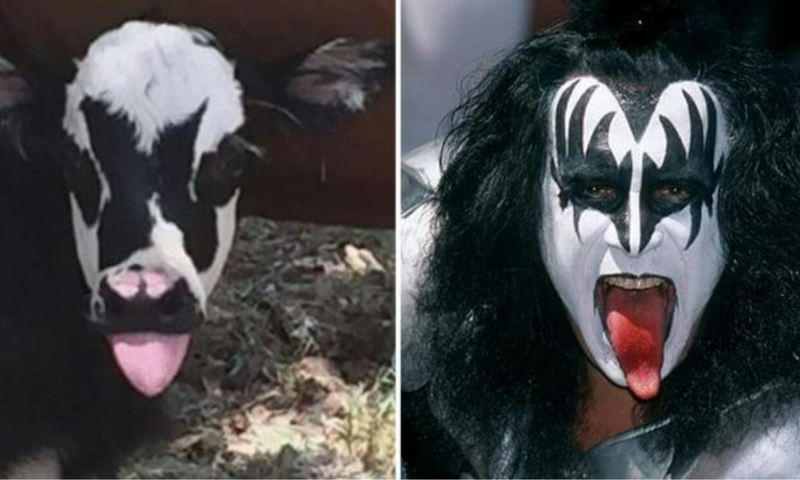 A newborn calf is getting a lot of attention because it bears a striking resemblance to Gene Simmons, front man for the rock group KISS. The calf, which is named Genie, was born Friday on a ranch near Kerrville, Texas, which is about 60 miles northwest of San Antonio. The calf’s black and white face markings are strikingly similar to the face paint Simmons wears when he is performing on stage. Anyone who has worked with farm animals knows that they can be stubborn at times. They often become rebellious, even when their owners are only trying to help them. In the same way, we humans tend to rebel against our Creator. We don’t want to go in the ways he wants us to go, even though he has our best interests in mind. God says that we shouldn’t be like dumb farm animals! We should heed his instructions and respond positively to his discipline. This entry was posted in Christian Living, Current Events and tagged calf looks like Gene Simmons, Gene Simmons, illustration, KISS, obeying God, rebel against God, stubborn, submission to God. Bookmark the permalink.